We did not muck around when we decked out our gym. We got the best of everything to help you get the best results. We’ve got everything you could need. You are in great hands with our trainers, they are motivating and offer creative and up-to-date training techniques at every session. We are huge fans of supporting local businesses and have teamed up with a range of locals to offer you extra special discounts and offers when you shop local and show your Rocket Fitness member key tag. If you have a business in the Somerset region and would like to meet some of our awesome members please contact us with any cross promotion ideas you may have. We have multiple sessions on each day and there is dedicated open times for members to come use the facilities out side of session times. Our memberships offer unlimited access to all sessions. Please see our timetable for more details. We are set up with Ezidebit through our software, membership fees are debited from your bank account every fortnight. Do you do one-on-one PT sessions? We sure do! Please contact Daniel on 0400 577 771 to arrange a one-on-one personal training session. We can also do private small groups if that’s what you’d prefer. Just bring a water bottle and towel. We have all the equipment you’ll need however if you have boxing wraps and your own gloves feel free to bring them too. Can I bring my kids to the gym? Of course, we are a very family friendly gym. We have an awesome gated off kids area called The Pocket Rocket Pit and your kids are always welcome in there under your supervision. We also have allocated times where we offer child minding as well. When there is a carer in the Pit there is a small fee payable but it’s well worth it to have an uninterrupted workout. There is no charge for children over 6 in the Pocket Rocket Pit. Please check our timetable for child minding times. 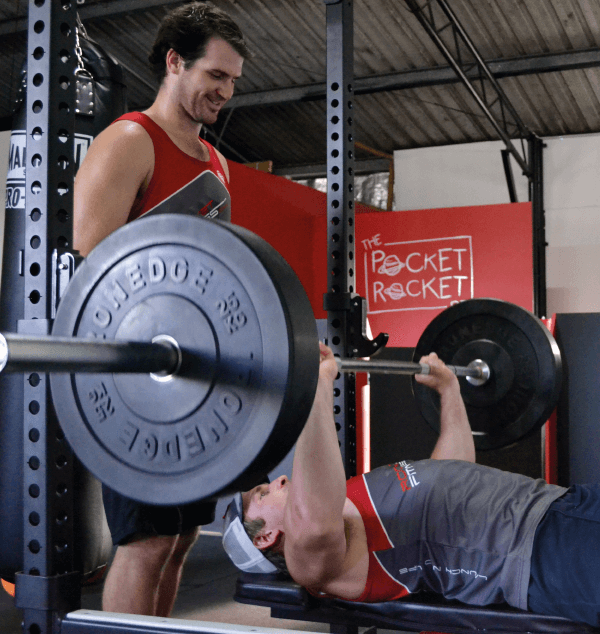 All fitness levels are welcome at Rocket Fitness. By having a personal trainer in every session we are able to alter the session to suit everyone. We can have a 70 year old, a 20 year old and even a person returning from injury in the same session and everyone gets a great workout because they can take it at their own pace. Every session has a warm up at the beginning. If you’re late, that’s ok but it’s your own responsibility to make sure your body is warm before you jump in. The trainers will generally give you a few exercises to do on the side of the class to get your body ready. The session will still finish at the scheduled time. Can I train if I'm pregnant? You sure can, our trainers have loads of experience in this area and will alter the session to your requirements. Remaining active through exercise during your pregnancy has been proven to have many benefits for both yourself and your baby. Remaining active while pregnant has benefits in the labour process too!